- make sure the butcher leaves the pork skin on the loin. - the skin needs to be very dry before you start cooking, so leave the loin in the refrigerator uncovered. - if the butcher hasn't scored the skin (which I think is the norm in the US), score it diagonally with a sharp knife. - as with any piece of meat, allow it to come to room temperature for about an hour before cooking. - heavily salt the skin. - roast at a high heat to start with for 20 minutes and then reduce to a lower heat for the remaining cook time. The result: thick, crispy, crunchy crackling. Basically the best part of the Sunday roast. The most perfect, meaty, juicy spread that a piece of toast will ever see. 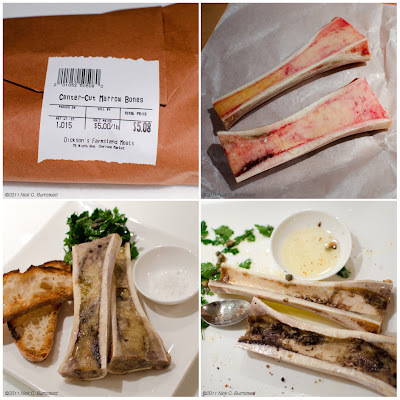 The marrow bones were purchased from Dickson's Farmstand Meats and cooked using chef Fergus Henderson's (St. John Restaurant in London) recipe from The Whole Beast: Nose To Tail Eating. 1) Roast the bones in a 450 degree F oven for 15 to 20 minutes. Check on the bones after 15 minutes, if you cook the bones too long the marrow will just render down. 2) Make dressing with lemon juice, olive oil, and capers. Taste and season with salt and pepper as needed. 3) Dress the parsley leaves with the dressing. 4) As per Fergus, don't season the marrow bones when pulled out of the oven, season as you eat with a good sea salt. 5) Scoop the bone marrow onto the toast, season with salt, and add the parsley salad. Don't go for any of the individual reasons you might normally go to a restaurant. Don't go for the food, although it has a point of view. Don't go for the vibe. Don't go for the service. Don't go for the music. Go, because it is an overall entertaining, unique, and fun experience. And go with a group of friends.